Back in the days, as they say, it started with string and scotch tape. That was levitation then. How could I publicize such secrets? There are no secrets anymore. Ask Mit Romney, Kate Middleton, and Prince Harry. I’m not talking about levitating a person, or other heavy objects, but something light…like a dollar bill. A real big leap was from scotch tape to wax. To me Fearson’s Floating Bill was superb. But as you all know it didn’t stop there. I don’t remember the order, but the Floating Rose, which I saw David Copperfield perform in person at the Place des Arts, the Hummer Card, ITR’s of every size and shape came onto the market.Then came the Tarantula. 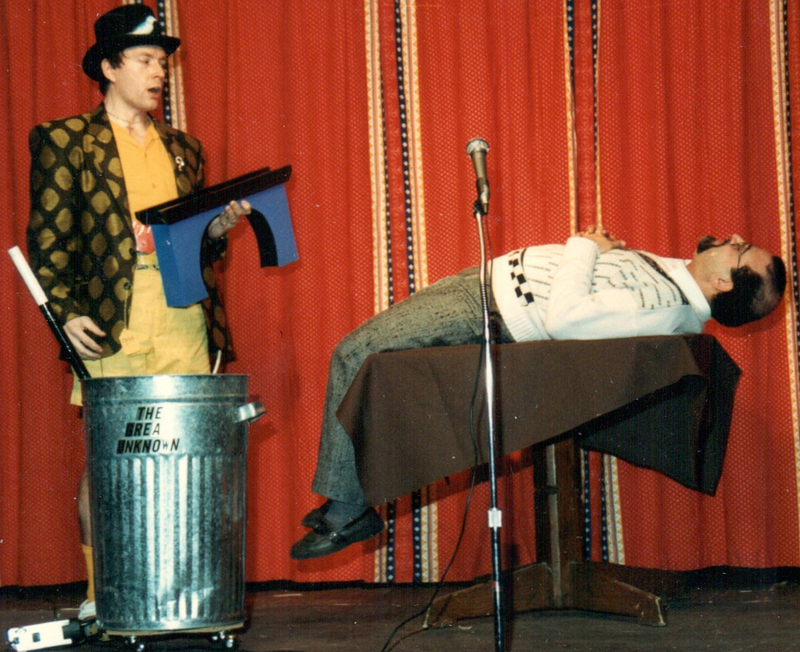 That was the top… for magic dealers and performers as well. This was a best seller. We’ve had hits like that before. There was Cardtoon, which is not a levitation, but a such a delightful card trick and is still a best seller. Also the Raven, which we ordered by the case at its heyday. And there were others as well. But with Tarantula, it was the price. And they were selling like Svengali Decks, which is still a top seller. Yigal Mesika put out a fantastic item and those who took the trouble to learn it properly got their money’s worth. Now Yigal has another effect. I watched him perform it and its lookin’ good. If you bought the Spider Pen, or if you didn’t, take a look at the Spider Pen Pro. That’s his latest and I’m sure he has another hit. That’s levitation now! We’ve come a long way, baby! 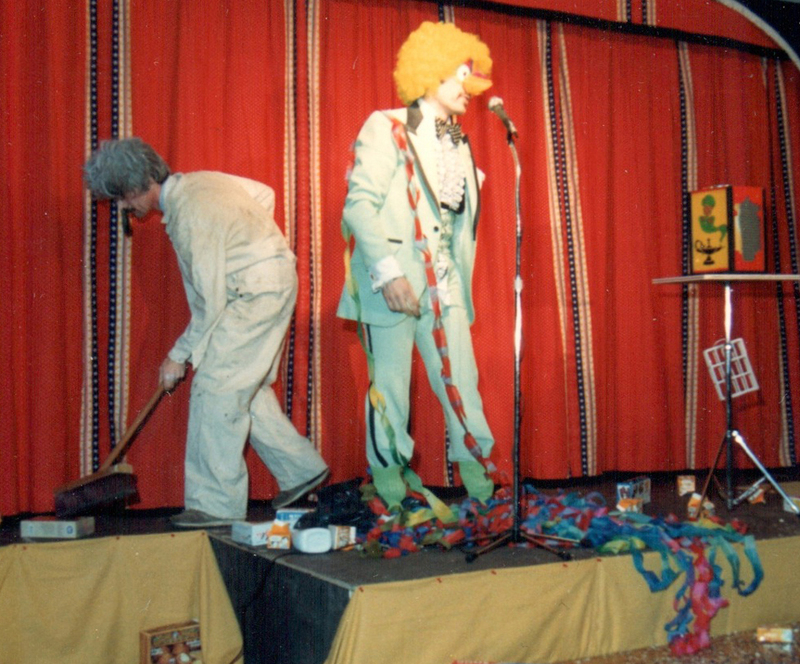 Although I have been involved in the magic business for over 35 years I have never performed in front of a real audience, until last week. Last Friday happened to be grandparents’ day at my 4 year old grand daughter’s daycare and we were called to see if we could come and perhaps read a story. We said sure, and I said to Phil that I would bring a magic trick as well. When we got there another grandfather was reading them nursery rhymes. My grand daughter ran straight to Phil. She always runs to him as she knows I have a bad back and won’t pick her up. When the grandfather finished his nursery rhymes we were introduced to the children and my grand daughter insisted on sitting on my lap as I read the Snow White and the Seven Dwarfs, which she chose. After the story, I told her to sit on the mat with the other children as I had a surprise for the children. This was my plan. I would do the Thumb Tip Blendo. If you are not familiar with it, it consists of four 2″ square silks, green, red, yellow and blue. I would have them call out the colour of each silk as I pushed it in my closed fist. They did this with much enthusiasm. Then I was going to tell them that believe it or not, there was only one silk in my hand and they should all call out what colour they thought it would be. I expected them all to shout out a different colour and then I would tell them that they were all right. But if you’ve ever done a magic show, I’m sure I don’t have to tell you that not everything always goes as planned. What could possible go wrong? It’s not as though I’m sawing someone in half. So I ask my question waiting to hear them scream out the different colours. But at the top of their lungs they all shout “RED”! You can imagine my surprise. I said RED? You all think its red? And they all shouted YES. And I look at my hand and I see the tiniest bit of red sticking out at the top of my fist. And I had to laugh. I leaned over and had one of the children tug at the red piece sticking out. When she pulled it out all the little mouths dropped open when they saw one silk with the four colours on it.Their reaction had me thinking about a new career. Just kidding! The moral of the story is that kids are great …and you always have to pay attention to every little detail…and there is a book on “OUTS” just in case! I think we could all use a smile so read on. When I wrote The Great Unknown I had it in the back of my mind that there were more photos, but I couldn’t find them. It seemed to me that one year Daniel Raymond, came on stage carrying a suitcase. He opened it up and out came his brother. Then I found some photos. I was going to put them up and then I misplaced those. While looking for them I found some others, and I also found the ones I misplaced. But what I didn’t remember was that in 1984 Daniel Raymond won the Tom Auburn Award. Daniel wrote us an email and enclosed a copy of a letter we had received and sent him. So after finding the photos and the letter and the email, I felt the post I had written had some salient facts missing. So to complete the picture…First the letter from Daniel. You know, what I remember the most accurately, not to say vividly, from Magie Montreal is, of course, the tremendous amount of fun I had participating but, above all, the enthusiastic and unexpected (by me) reaction of spectators after my performances. I came to Magie Montreal, as a performer and as an MC, with no expectation and no ambition whatsoever, really! no kidding! 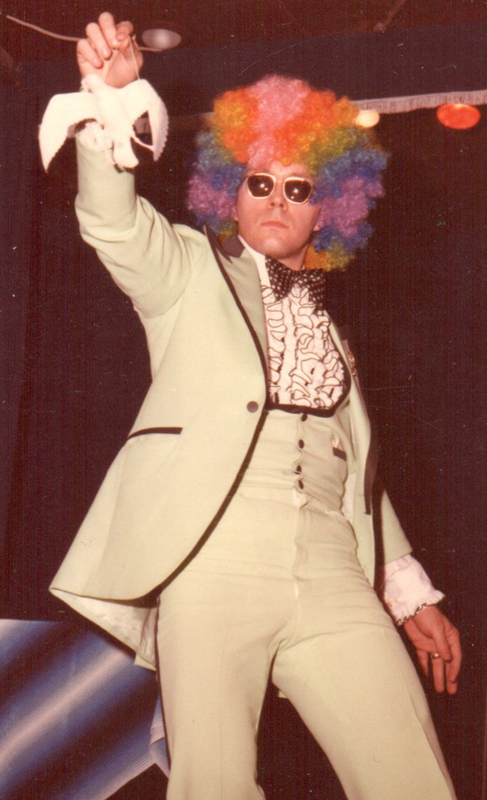 My only goal was enjoying myself and giving fun to the audiences to the best of my limited abilities. I always entered competitions while being perfectly aware of my ‘’amateur’’ status and the fact that I was performing along with, and among, professionals. So, my expectations were extremely realistic. 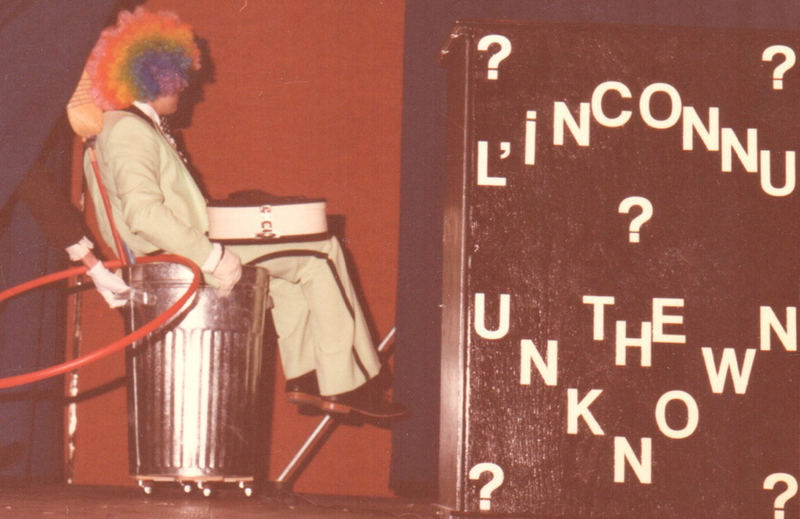 That’s why I was the most surprised person (of them all attending the convention) when I won the Magic Tom Auburn Award (for most entertaining act) in 1984. I never, ever, took myself seriously and always went for the experience, the fun and the mingling with seasoned pros. But it has always been pleasant, moving and heart-warming to see people who felt sorry for me when I didn’t win the stage competition, even though I was not expecting it myself in the first place. Somehow it showed me that I must have been doing a good job after all, for an amateur. And I never felt bad, not even for a fraction of a second, when the prizes went to better rehearsed magicians than me, especially magicians who were trying to win an honest living out of their magic by opposition to me, the part-time clown. 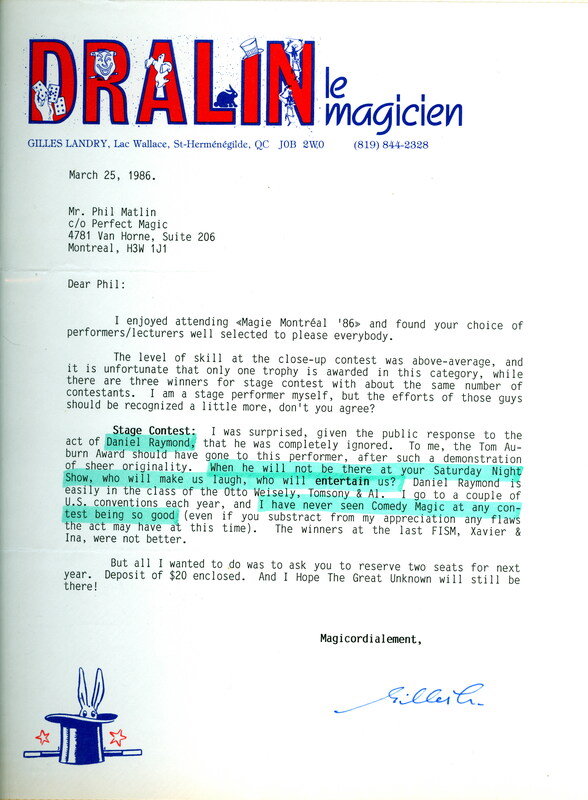 I thought it would bring you a smile to read/rediscover a letter that DRALIN sent to Phil back in March 1986. Of course that Dralin was being overly nice to me but, at the time, even though I perfectly understood (and agreed with) the competition outcome, I found his letter very touching. We barely knew each other and he had no obligations to go out of his way to write about his feelings.